Our female-fronted pop culture picks for the week are here! Ring in Aries season with the last season of Jane the Virgin, new tunes by Jenny Lewis, and so much more. Jane is back for a fifth and final season! Between this and the show’s upcoming spinoff, the CW is definitely giving us all the soapy television we’ve been craving (or is it just me?). The show returns March 27, but if you need something to tide you over, check out our 2017 cover story with star Gina Rodriguez. Jordan Peele’s latest psychological thriller stars Lupita Nyong’o and Winston Duke as a couple headed for a family vacation when they’re confronted by a group of evil doppelgängers—we’re intrigued (and kind of terrified). Out Friday, March 22. Jenny Lewis’ fourth solo album is here! According to our music editor, Emily Nokes, “On the Line largely emphasizes what Lewis does best: spin melodies with just-detailed-enough lyrics that roll around in your mind for days to come.” Stay tuned for our review on BUST.com. Out March 22. D.C. trio Ex Hex returns with an energetic second album that’s “big and raucous, but carefully crafted,” writes our reviewer. 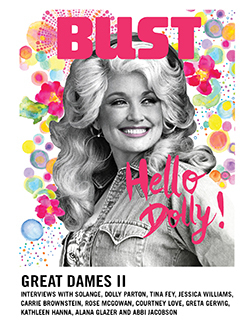 Review to come on BUST.com, and album out March 22. 23-year-old Nilüfer Yanya has been one to watch with various genre-bending EPs and singles—but her debut album, Miss Universe, firmly solidifies her as the next big thing. Album out March 22. Award-winning short story writer Amy Hempel returns with her first collection in over a decade. This buzzed-about book includes 15 stories of loneliness, heartache, and the search for connection. Out March 26. Jacob’s graphic memoir recounts conversations the writer has with her young half-Jewish, half-Indian son—about identity, racism, and love. Out March 26. Lalami’s latest novel, about a collection of characters who find their lives intertwined after the murder of a Moroccan immigrant in California, is both a mystery and a saga of family, love, and culture. Out March 26. Julie Langsdorf’s suburban dramedy features an ensemble cast of neighbors clashing, hating, and falling in love with each other. Out March 26.